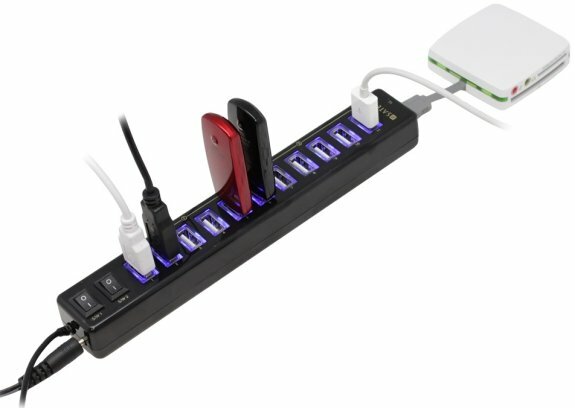 Tom's Guide delivers news that San Diego based Satechi has introduced a 12-port USB hub in the shape of a power strip. The top of the product features eleven LED-lit USB 2.0 ports and a twelfth port is mounted opposite of the USB connector that plugs into your computer. Two control switches allow user to turn on just the first six, or just the last six, or all eleven of the top-side USB ports at once. Regardless of how many ports are on or off, the USB hub comes equipped with a power supply to guarantee the electric current stability and effective operation of the connected USB devices. This way, users can recharge their smartphones and tablets while also accessing their stored data. There's no severe battery drain on the laptop or a strain on the rig's power supply. "Providing data rates of up to 480 Mbps, this 12-port hub is the ideal solution for transferring data between your computer and external USB storage devices," the company states. "It does not require any software or complicated installation process. With the slim, strip-shape design, it saves your precious desktop space. It's extremely portable and easy to move between systems or take on the road." Seems like an interesting idea, but without USB 3.0 support it's a couple of years late and its $29.99 price isn't a bargain either.